A couple of weeks ago, I was really inspired by a topic on Decorum: If someone asked you to define your personal decorating style in three words, what would they be? It led me to do a post defining my own style, but I also felt inspired to ask some of my favorite bloggers how they would define their personal style. My goal is to bring together some of my favorite bloggers and to showcase their different styles. I want to focus on the importance of individuality and personal style. Even if we identify with a particular style or trend, no matter how popular it may be, there is always a way to make it our own. "The Personal Style, Defined." series will feature a different blogger each week, who will share a room with us that is the embodiment of her personal design aesthetic. 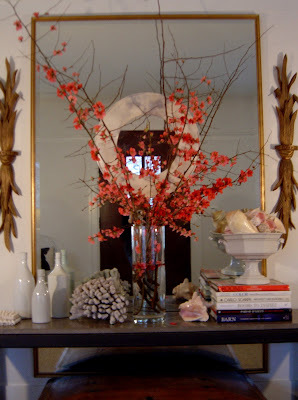 Katie's gorgeous console table changes with the seasons. To kick things off, I couldn't have asked for a sweeter or more talented blogger. Katie Denham, of katiedid writes one of the first design blogs I ever read and has always been personable and accessible. Katie is a super talented interior designer who has a knack for writing. She recently decided to start her own design firm, Katie Denham Interiors, which is already doing quite well. Without further ado, I present Katie's "Personal Style, Defined." First, I wanted to thank Paloma for inviting me to participate in her “Personal Style, Defined.” series! I have been thinking about how to define my personal style. Not all that easy really. There are so many styles I love to work with for my clients, and so many styles I love to see from other designers. I try many of them on for size for myself….in my own home. Some work for me…some don’t. Sometimes I find that an idea or an object I thought I would never tire of, I start to see everywhere…..so, like a song that is overplayed on the radio….I have to turn the station to something new. So, back to the question. Defining my style. I think it is tailored, timeless and fresh, with a little bit of something unexpected or humorous so as not to be static. I like traditional rooms with a modern twist. I like modern rooms with a traditional classicism. The room above is a place where my family spends the bulk of our time. We think about, plan for, prepare and eat meals at home a lot. The feeling I wanted was of a beach house with lots of windows, lots of light. And I wanted it to tie in with the rest of our 1911 house. I used v-groove paneling , beams, and open shelving to create a casual atmosphere. The wood floors are used throughout the rest of the house as well. So….to add a little something different, I used four industrial beaker type light fixtures above the island, and added the modern classic barstools by Bertoia. Paloma asked what our favorite thing was in the room we were posting. I would have to say, in this room, it would be my dog, Cooper. After all, he is a classic….sort of like an Eric Clapton song. A huge thanks to Katie for being the first one to take the plunge in this series! Your kitchen is absolutely gorgeous! Enjoying your comments and photos. Would like to see that beautiful dog more clearly though! Best part of the photo! Great new series! I love Katie and it was great to see what she defines her style as. fantastic series, i can't wait to see more. Katie is a great choice to start your series! I like how she explains her choices for her gorgeous kitchen. Good, timeless design will always be classic. Katie's got it. one of my favorite bloggers! one of my favorite kitchens!!!! Beautiful pics. I agree about having to define our style. Great post. Lovely feature! I have loved Katie's kitchen for so long. And how can one resist adorable Cooper?! I especially love the dog lying on the kitchen floor...so cute! What a great beginning to a design series. I will look forward to reading it each week. 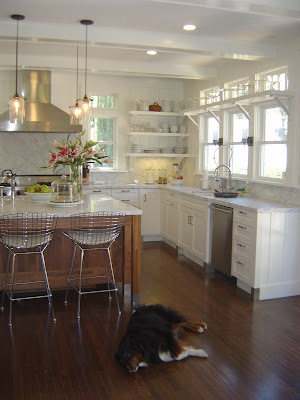 Katie's kitchen is gorgeous and her blog is spot on. I enjoy reading it regularly. Her dog (is it an Austrian Sheppard or a Bernese Mountain dog?) is so adorable. This room with this dog in it reminds me of a post I just did...please take a look!